A host of other nutrients, such as magnesium and vitamins C and B12, are emerging as potential nutrients for optimal bone health, too. When you think about bone nutrition, you probably think of calcium first. And rightly so: A solid body of research suggests that you should meet your daily calcium needs (1,000-1,200 milligrams) for optimal bone health. With 54 million Americans suffering from osteoporosis, it’s important to do all you can to feed your bones to prevent this debilitating condition. The promising news is that a host of other nutrients, such as magnesium and vitamins C and B12, are emerging as potential nutrients for optimal bone health, too. Magnesium. Fifty to 60 percent of magnesium in the body is located in the bone, so it makes sense that magnesium influences bone formation. Recent research suggests that magnesium deficiency could be a risk factor for osteoporosis. A 2014 study in the American Journal of Clinical Nutrition found that lower magnesium intake is associated with lower bone mineral density (BMD), while a 2010 issue of Biological Trace Element Research found that magnesium supplementation at 90 per-cent of the RDA suppressed bone loss in postmenopausal women. The National Institutes of Health concurs that diets that provide the recommended amount of magnesium (see “Bone-Loving Nutrients”) can enhance bone health, but cautions that further research is needed to fully understand the role it plays in osteoporosis prevention. Vitamin C. Widely recognized for its role in maintaining a healthy immune system, vitamin C also is a major player in bone development. The current literature on the relationship between vitamin C, bone metabolism, and osteoporosis in humans is outdated and inconsistent, but, recent animal studies show promising findings. Researchers from Mt. Sinai School of Medicine reported that vitamin C had a positive effect on preventing bone loss in mice, which could translate to humans. Vitamin B12. This vitamin is best known for its neurological functions, but it also may affect bone formation. 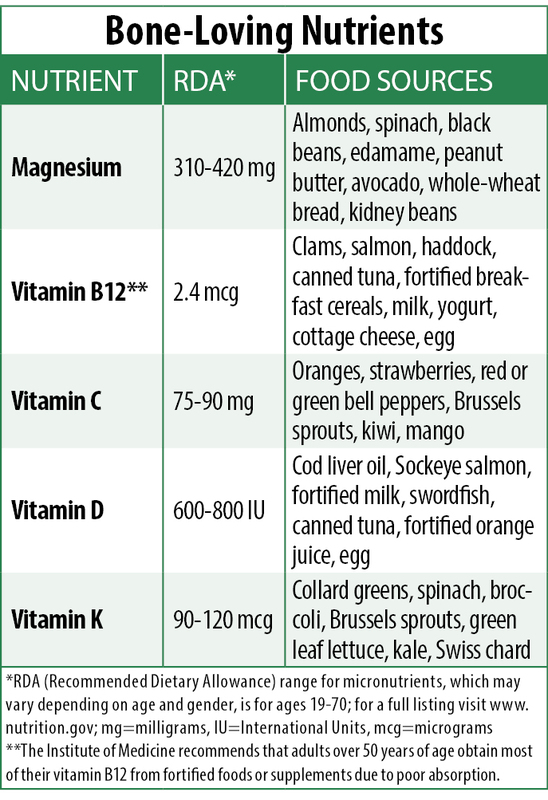 A 2013 re-view in The Journal of Nutrition and Metabolism found an association between low B12 levels and low BMD. Similarly, Turkish researchers found a significant association between B12 levels, BMD, and osteoporosis in postmenopausal women. Other Nutrients. Vitamin D plays an essential role in calcium absorption; insufficient levels can lead to rickets in children and osteoporosis in adults. A 2012 meta-analysis in the New England Journal of Medicine found that supplementation of at least 800 International Units (IU) of vitamin D reduced the risk of hip and non-vertebral fractures. Vitamin K also has gained attention recently for its role in bone health. A 2014 review in the Journal of Nutrition and Gerontology and Geriatrics con-firmed a link between vitamin K intake and reduced risk of fractures. Tags b12, bmd, bone, bone health, bone loss, bone mineral density, calcium, children, for osteoporosis, health, immune system, magnesium, magnesium deficiency, metabolism, nutrients, nutrition, osteoporosis, osteoporosis prevention, postmenopausal, postmenopausal women, rickets, studies show, trace element, vitamin, vitamin b12, vitamin c, vitamin d, vitamin k, vitamins, your bones.